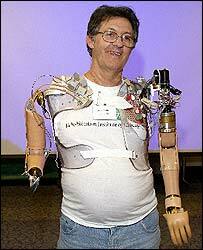 Jesse Sullivan from Tennessee in the US is the world's first 'bionic man'. He lost both his arms after receiving an electric shock at work, and despaired that he would never live independently again. But within weeks of the accident, scientists at the Rehabilitation Institute of Chicago (RIC) had replaced the 58-year-old electrician's left arm. He was given a special "bionic" arm - a mechanical device directed by his own brain. Now he can feed himself, shave, put on his own socks and glasses, weed and mow his garden. He can even make the small movements required for tricky actions such as opening jars. And he can throw and catch a ball with his 10 grandchildren. "When I first came to Chicago I was still suffering from the accident and I felt deep anxiety and fear," he said. "But now I feel great, this has given me hope for the future". Called neuro-engineering, the new technology literally connects people to machines. The four major nerves, which used to go down Jesse's arms, were dissected from his shoulder and transferred on to his chest muscles. The nerves grew into the muscles, which then allowed him to direct his senses through his own brain impulses. He can now raise his elbow, open and close his hand and rotate his hand and lower it. His right arm has been replaced by a traditional prosthetic arm, but he says the new and old technology work well together - allowing him to use his bionic arm for the more delicate procedures and his right arm for the heavier work such as lifting. "When they first gave me a prosthesis it was Second World War technology and I was devastated. "Then they said they had some experimental surgery they wanted to do on me. "I thought about it, but I had already lost both my arms and so there was no downside to the surgery. "They said my chest could go numb when they put in the nerves, but I was not using it anyway. "I felt it was an honour to take part in the work." Over the years Jesse has built up the number of things he can do and as the technology advances so do his motor-skills. "I don't wear the arms every hour of every day, but I wear them when there is something I want to do. "I painted my window. It took me all day, but I did it. It is all a process of learning." Although Jesse is much more mobile he realises there is still a long way to go. "I say this arm is the first step so a couple of years from now 'who knows'. "I am excited. I would like to have my arms back, but that is not going to happen." Dr Todd Kuiken, Director of Neural Engineering Center for Artificial Limbs at the RIC, said Jesse had been to the institute 14 times since his accident for weeks of experiments and adjustments to his bionic arm. He said this was the first time a nerve-muscle graft had been used to connect an artificial limb and that they were constantly trying to improve Jesse's arm. Jesse can currently feel sensations in his arm when his chest is pressed. "When you touch Jesse's chest it feels like you are touching the skin on his hands or his thumb or pinkie." Now the scientists are hoping to add special sensors to his hands to allow him to feel how hard he is squeezing something, but Dr Kuiken said this was still in the laboratory stage. Dr Kuiken said Jesse preferred to keep hooks rather than hands on his arms, because he found them easier to manipulate. Since Jesse's operation another three amputees have trialled the technology and in two cases the future is also looking good. There are hopes that the technology, which is currently very expensive, can be modified for general use. There are thought to be over 500 service men and women who have returned to the US from Iraq and Afghanistan as amputees and Dr Kuiken said he hoped that the groundbreaking technology could be used to help them. "RIC is excited about the unmistakeable potential our research has to help the US military personnel returning from war after suffering amputation. "In fact, we are actively engaged in a proposal process to revolutionise prosthetics with the Defense Advanced Research Projects Agency of the US Department of Defence."